The Wistron's Polaris was the basis for the heavy duty S822LC (see our review here). An improved version, the Polaris Plus was the first Power8 + P100 NVLink, probably the fastest 2U HPC server available (see here). The Supermicro "Briggs" which is found in the latest IBM S822LC "For Big Data". As far as we know, the Supermicro board is only available as an IBM server. The Rackspace Barreleye is the odd one out: it is 1.25 U (instead of 2U) high, 21 inches wide, and needs the power shelves of "OpenRack". The cool thing is that it is no longer a prototype; it is a server that can actually be bought. This means that those who want to start over and make use of the many advantages of OCP have a real choice between the Intel Xeon and IBM POWER. Such servers - even in low quantities - are available from Penguin Computing (Magna 1015), Mark III systems, and Stack Velocity. Of course, most datacenters are not switching to OCP racks (yet). If you want a standard 19 inch wide OpenPOWER server, there is a pretty good chance your server is based upon the Tyan Habanero. Habanero was not only the platform in most of the Tyan POWER8 offerings, but it is also the board that can be found inside the IBM S812LC and the Penguin Computing Magna 2001. Of course, the OpenPOWER server market is still a young and small market, but Tyan did have quite a bit of impact. So when we saw that Tyan made a 1U server based upon this Habanero platform, that caught our eye. The power-hungry POWER8 inside a density optimized form factor? And they feed it with a PSU of "only" 750 W? Remember, most POWER8 servers come with 1000+ Watt PSUs. Now at this point you may be asking: yet another article about OpenPOWER? Isn't all effort going to waste as IBM's piece of the server market is shrinking and Intel reigns supreme? Why would IBM be able to succeed where so many others have failed? We are among the first to recognize that Intel still rules the server world, and that there is no alternative to the midrange Xeon E5 when you want the best performance-per-watt available. Furthermore the arrival of servers based upon AMD's Naples CPU will put even more pressure on all non-x86 server CPU alternatives, as it is expected to ship with up to 32 cores, 64 thread, offer 8 DDR4 channels and integrate no less than 128 PCIe lanes. And in the long-run (and perhaps most importantly), it will force Intel to come up with better performance/watt/dollar offerings, ratcheting up the pressure on non-x86 server CPUs even further. As important as performance-per-watt is, several markets – HPC, Analytics, and AI chief among them – consider absolute performance the most important metric. Wattage has to be kept under control, but that is it. Who cares whether the CPU is consuming 200W or 120W when it is placed in a machine with a Terabyte of RAM and two 300W GPUs? The fact that Rackspace and Google have invested quite a bit in the "Barreleye" and will continue to do so is a good sign (there is a POWER9 Barreleye) but not a guarantee. Both companies and all large datacenters still rely on Intel Xeons for the foreseeable future. The experiment can quickly be terminated. However, the announcement that China's largest Internet portal – Tencent – will also be using OpenPOWER servers is another sign that the OpenPOWER technology convinces people that it is a viable alternative. 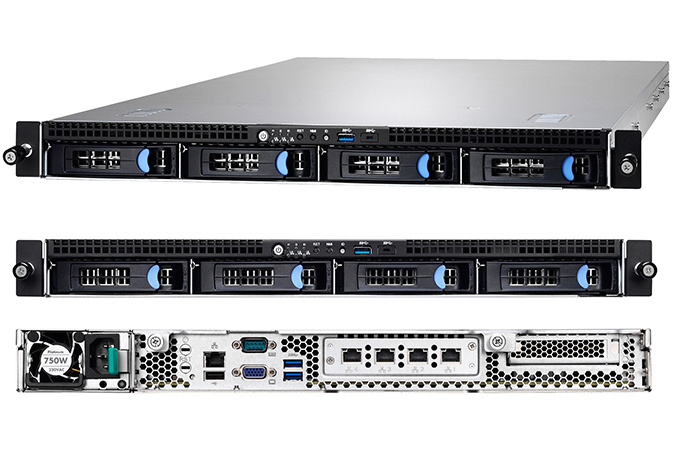 At first, the deal was just to license the affordable IBM S822LC (made by Supermicro) to the Chinese reseller Inspur, and Inspur – being a "local" reseller – would sell it to Tencent. However, this deal spurred Inspur to begin developing their own OpenPOWER products. Consequently, OpenPOWER is allowing IBM and partners to break into the fastest growing server market: China. The openness of the software and hardware ecosystem and the strong performance of the CPU cores puts OpenPOWER is a very unique position in China compared to both Intel and ARM. That is a very solid business plan if you ask us. The GT75 is a weird system and I've never been clear on why it exists. The Supermicro 1U (S821LC) at least gets you two CPU's for cheap in 1U... I'm not overly surprised by poor performance here. This is a 130W CPU, not a 170 as Anandtech says, running at low clocks. 170 is only the turbo power. I'm also guessing it's loud as hell with those fans. That being said - Anandtech also has a history of interestingly Intel-centric interpretations of results. Remember when Intel's uarch was "a lot more sophisticated" than P8 according to Anandtech based purely on ST 7zip results, and then when ThunderX did well on 7zip, Anandtech said 7z was a meaningless benchmark irrelevant to server workloads? I've also noticed that since gcc's Power output improved (~4000 MIPS single-thread compression with gcc 6.2 on 3.3GHz P8), 7zip has conveniently vanished from Anandtech's Power reviews. The idea of drawing conclusions about microarchitectures based on a balance of a range of tests seems alien to them. Looked at through that lens, Power8 (well, in systems not named GT75 :P) looks decent at some things, less decent at others, but overall pretty good. Database perf/W, per Anandtech's testing, is better than Haswell. This isn't a bad place for P8 to be, considering it's been shipping since early 2014 and is on the verge of replacement. 7zip is indeed a bad indicator for server performance, but at the time, we only had access to a virtual machine on top of a POWER8 with 2 GB of RAM and we thought it might give us a first glimpse of what the P8 was capable off. This isn't the best showing of POWER8. Those chips need robust cooling to keep their clock speeds up to be competitive. The 1U form factor does place a lot of constraints on the design. As for the Tyan system itself, I'm kinda of surprised that they went with the Centaur buffer that uses DDR3 as IBM has reportedly been shipping buffers that support DDR4 for nearly half a year now. That'd lower power consumption greatly, though likely not enough to be competitive with Intel on a system level performance/watt metric. Moving to DDR4 would give the system a massive increase in memory capacity as 128 GB LR DDR4 DIMMs are shipping with 256 GB LR DIMMs on the horizon. Using 256 GB DIMMs, a system like this would support 8 TB which is a lot for a 1U server. Considering the internals of the system I'm not surprised but a secondary PSU option would have been nice, even if it was external. PSU redundancy is remarkably common, even for 1U systems. I'd also be worried about IO performance on this system with all the networking and SATA ports hanging off of a single PCIe uplink to the CPU. Form factor does matter when it changes the cooling system which in turn can invoke thermal throttling.